Third Midweek Advent Service: "Good News"
Good news is given (a gift), good news is shared. Luke’s account of the Christmas story draws us into the same pattern: God reveals his gift to us in the birth of Jesus, and there’s rejoicing in the Good News. “Fear not, for behold, I bring you good news of great joy that will be for all the people. For unto you is born this day in the city of David a Savior, who is Christ the Lord. The shepherds ran to find this Good News lying in the manger, wrapped in swaddling clothes just as the angel said. Everyone the shepherds told were amazed at the Good News concerning this child. Mary treasured this Good News and pondered it in her heart. During Advent and Christmas, we join with the people, the shepherds, and Mary as we receive and rejoice in Good News. In the last five verses of From Heaven Above to Earth I Come, Luther invites us to join the shepherds, the crowds, and Mary in receiving and rejoicing in this Good News of Jesus’ birth. And if we’re honest, each of us, for one reason or another, needs some good news this time of the year. For we live in a bad news world. We’ve probably all had days when we’re afraid to turn on the TV or answer our phone… “what bad news is next?” we wonder. The lives of our family and friends seem to be full of bad news: car accidents, cancer diagnoses, strokes, heart trouble, undiagnosed diseases, despair, depression, and suffering. The bad news is personal too: our own conscience is plagued by sin, guilt, and death. And the devil loves to whisper an endless stream of fake news in our ears: look at you and all your sin, you’re hopeless, a lost cause; there’s no good news for you; you don’t deserve it. You’re right, devil; I don’t deserve any Good News; I’m every bit of the sinner you say that I am; but Christ our Lord has come and joined us in our humanity in this fallen world; Jesus was born of the Virgin Mary, suffered under Pontius Pilate, was crucified, died, and was buried to put an end to your lies, all my sin, sadness, and death; Emmanuel, God with us, gives us Good News that in his birth, life, death, and resurrection, all the bad news this world, all of your accusations, and all my sin has been forgiven, cancelled, pardoned, atoned for, and redeemed. Glory to God in the highest, and on earth peace among those with whom he is pleased. The shepherds find their Good News, and ours, wrapped in swaddling clothes and lying in a manger; the King of kings; yet our kinsmen; the Word by whom the heavens and earth were created makes a Virgin’s womb his royal chamber, and a feeding trough his bed; the Mighty God, the Prince of Peace, the Wonderful Counselor becomes a weak, lowly, and helpless infant for you; the God who is, who was, and who is to come is Immanuel, God with us. To be enthroned in royal state. No wonder Mary treasured up all these things and pondered them. She saw that she herself, a descendant of Jesse, had conceived and born God’s Son by the Holy Spirit. She had read in the prophet about a shoot that will sprout from the root of Jesse. She had heard, And you, Bethlehem Ephratha, are a little one among the thousands of Judah, yet out of you will come forth for me one who is ruler in Israel. She saw that she had conceived and born a son yet as a Virgin, just as Isaiah foretold: the Virgin will conceive and bear a son, and his name will be called Emmanuel. 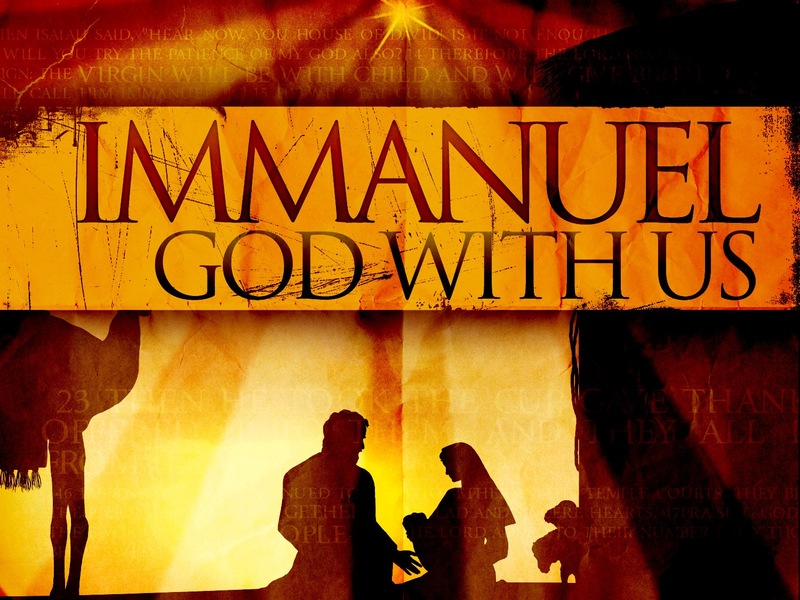 God with us in His Word, just as He was in the Word the angels declared to the shepherds. God with us in the manger of bread and wine before our eyes, just as he was in the manger in Bethlehem. God with us, working faith and trust in his Word by the same Holy Spirit who overshadowed Mary and conceived in her womb this holy child born for you. In these last 5 verses, Martin Luther invites us to join Mary in pondering God’s gift of salvation revealed in Jesus’ birth; he invites us to join the shepherds in glorifying and praising God for sending His only begotten Son to be our brother and Redeemer, and to spread this Good News to everyone we know, especially those in need of Good News; he invites us to join the crowds in wonder and amazement at this unexpected, undeserved, unconditional free gift of life and salvation in this baby boy; and he invites us to join the angels in singing this Good News. Who unto us His Son has given! I’m a bit of a history wonk. 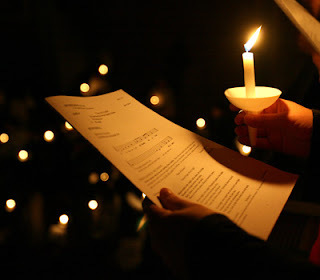 So, naturally, when I sat down to write a few thoughts for our meditation this evening, I did what most modern historians do: I googled a history of Christmas caroling. I know what you’re thinking…not exactly a sound methodology, pastor. And you’re right. Searching Google for reliable history can be about as productive as looking for a good fruitcake recipe. But after ignoring numerous links to the Top 10 worst Christmas movies of all time; after looking at several lists of “Everyone’s Favorite Christmas Carols”; after shoveling through all the fluff, like a Midwesterner looking for his car in a snowbank, I finally found a few reliable gems of historical fact. Christmas carols experienced a modern revival in Victorian England when William Sandys, an English lawyer, published Christmas Carols Ancient and Modern in 1833. Many of the most well-known Christmas carols, such as Joy to the World, God Rest Ye Merry Gentlemen, and Hark! The Herald Angels Sing, all date to the 1800s. But earlier than that, in the Lutheran Reformation of the 1500s, Martin Luther, and many other Lutheran reformers were busy restoring many of the ancient Latin hymns of the early church to the language of the people, as well as writing their own hymns such as Luther’s cradle hymn: From Heaven Above to Earth I Come. In the 13th century, especially in France, Germany, and Italy, Francis of Assisi was instrumental in pairing Christmas hymns with teaching the Christmas story. 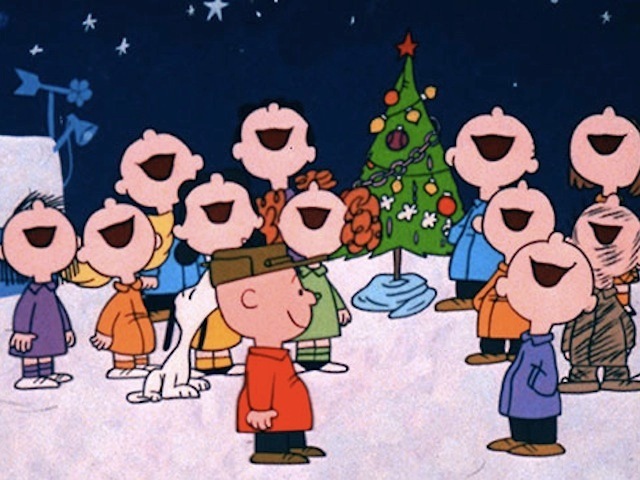 In the 9th and 10th centuries, before him, Bernard of Clairvaux influenced a sequence of Christmas singing in the monasteries of Northern Europe. Some of our oldest Christmas carols date back to the 3rd and 4th centuries: to the Spanish poet Prudentius (Of the Father’s Love Begotten) and Ambrose of Milan (Savior of the Nations Come). But of course, the history of Christmas caroling goes back much farther in time, to a Virgin in the city of Galilee in Nazareth, whose name was Mary. After the Angel Gabriel visited Mary and told her that she would conceive in her womb and bear a Son whose name was Jesus, she sang the first Christmas carol: the Magnificat. My soul magnifies the Lord, and my spirit rejoices in God my Savior. Zechariah joined her later in his own song, The Benedictus, at the birth of his son John, the forerunner of Jesus. Blessed be the Lord, the God of Israel, for he has visited his people and redeemed them. The angels too, brought the song of heaven to earth as they visited the shepherds and sang:Fear not: for, behold, I bring you good tidings of great joy, which shall be to all people. For unto you is born this day in the city of David a Saviour, which is Christ the Lord. And as Simeon held 40-day old infant Jesus, God in human flesh, he sang as well: Lord, now you let your servant depart in peace; for your word has been fulfilled. As Linus told Charlie Brown, that’s what Christmas is all about. Tonight, we join in Mary’s song of thanksgiving for her Son, our Savior, who was born under the Law to redeem, rescue, and ransom us. We join in Zechariah’s joyful song for the Lord who became flesh and dwelt among us to redeem us. We join the angels in singing “glory to God in the highest, and on earth peace among those with whom he is please”. We join Simeon in praising the Lord who keeps his promise to save us in Jesus.You see, wherever you find God’s people gathered together, you’ll find them singing Christmas carols. That’s what we do at Redeemer: we hear, read, and sing God’s promises to us in Christ.So, we thank you for coming tonight, for joining us in our caroling; and know that whether you love to sing or whether you would rather sing Tenor…ten or 15 miles away…we want you here with us for every Christmas carol, song, and hymn…as together to sing the praises of Jesus who called us out of darkness into his marvelous light. A blessed Advent and Christmas season to each of you…In the Name of + Jesus. Amen. Sermon for Advent 2: "Prepared"
As of today, there are exactly two weeks to Christmas Eve. Have you made your list and checked it twice? Are you ready? Are you prepared? That’s word of the day this 2nd Sunday in Advent. Prepare. Many of us spend a lot of time preparing this Advent season. We wash the Christmas dishes that have been tucked away since last year. We turn our homes around, trading pumpkins and fall colors for Christmas wreath candles and the Advent calendar. And of course, there are cookies to bake, family recipes to bring out of hiding, and tables to prepare for family and friends. Into the busy-ness of our holiday preparations, John the Baptist bursts in. Only he doesn’t seem to care if we bring out the crystal wine glasses or a red Solo cup; he doesn’t beg for our grandma’s cookie recipe; and let’s be honest, you wouldn’t want John to bring his famous locust and wild honey appetizers to your Christmas party, would you? Probably not. After all, he’s clothed in camel hair. His diet seems a bit questionable. And his living arrangements in the wilderness don’t exactly sound like a welcoming bed and breakfast. You see John is a simple man. And he comes to deliver his simple, yet significant Advent message. John preaches God’s Word to prepare his hearers for the Word made flesh. John proclaims a baptism of repentance for the forgiveness of sins to prepare his hearers for the Lord who forgives sin in his dying on the cross. John prepares his hearers for Jesus’ coming by pointing away from himself to Christ, the Lamb of God who takes away the sin of the world. This is why John the Baptist makes us so uncomfortable. He reminds us that we are far too comfortable with our sin; he reminds us how quickly we turn from things eternal to things temporal…that much of what we worry and fret about will wither and die like the flowers of the field: for the grass withers and the flowers fade, but the Word of the Lord endures forever; and most of all, John speaks the truth about our sin. This is how John prepares us for Christ’s coming. John calls us to repentance and forgiveness in Jesus. So, John bulldozes our pride, to build us up in Christ’s humble birth and death for us. John plows through the hard packed soil of our sin to reveal the depth of our disease; to turn our hearts, ears, and minds into fertile soil where Jesus plants his life-giving Word. Where Jesus’ promises take root, grow, are fed and nourished by Christ the vine. John is God’s weed-wacker, sent to clear out all the weeds that choke and smother our hearing of God’s Word, so that all we have to cling to is Jesus’ cross, our tree of life. This is the way of the Lord John prepares us for, the highway that leads to Jesus crucified for you. John breaks our heart of stone to prepare the way for Jesus who creates in us a clean heart and renews his Spirit with us. John prepares us for Jesus’ Advent the same way he prepared his disciples for Jesus’ first Advent, by calling us out of the wasteland of sin, through the oasis of Baptism. John’s baptism was a baptism of repentance for the forgiveness of sins in the Jordan River. So, John continues to call us back to the greater waters of our Baptism, to our Jordan River at the font. In Holy Baptism we are repented, that is turned back to God; forgiven; and cleansed, washed, and filled with the Holy Spirit. You see, your Baptism is a lot like the season of Advent and Christmas; through water and the Word, God prepares you for Jesus who also comes to you and gives you new birth from above. Unlike our favorite Christmas dishes that gather dust, get scuffed and scraped, and eventually wear out and break – In your Baptism, Jesus cleanses you with a promise that never fades, cracks, breaks, or corrodes. You are washed in the life, death, and resurrection of Jesus who was born to save you. John prepares us for Jesus’ Advent by showing us the depth of our sin, that he may show us our greater depth of our Savior’s love in rescuing us from sin. John prepares us by calling us to repentance. Confessing our sin may not feel like much of a gift or a blessing, but it is. It’s God’s gift and his work in us. It’s a preparation, just like John’s Baptism… repentance for the forgiveness of sins; we confess our sin. And God is faithful and just to cleanse us from all unrighteousness. You see, even our confessing our sin, is the work of the Holy Spirit. For unlike our holiday decorations around the house, we aren’t the ones who turn things around in our preparation for Jesus’ Advent. In Holy Absolution, Jesus works both repentance in you and forgiveness for you. God’s Word reveals that we are indeed great sinners, but that we have a greater Savior in Jesus. Comfort, comfort you my people, says your God. Your warfare is ended. Your iniquity is pardoned. You have received from the Lord’s hands double forgiveness for all your sin. John prepares us for Jesus’ Advent, for his coming among us. Behold, the Lamb of God who takes away the sin of the world. And Jesus, the Lamb of God, shepherds you to his Advent feast, where he feeds you with the Bread of Life, his own body; he lifts up the cup of salvation, his own blood, for the forgiveness of all your sin. John prepares us this Advent for the coming kingdom of Christ, the One who came by way of manger and cross and tomb, the One who now comes to us by His Word and water and bread and wine, the One who will come in great glory seeking not works but faith, trust in His Word and promise. And unlike our Advent and Christmas parties, you don’t need to count calories at this feast of forgiveness; Jesus’ mercy and grace for you in the Lord’s Supper will never rot, spoil, or turn sour; here, at Jesus’ table, we’re fed with eternal satisfaction. Come, the table is set. All is ready. You are prepared. Advent Midweek Sermon: "God's People Sing"
Miriam sings of YHWH’s Red Sea rescue: I will sing unto the Lord for he has triumphed gloriously; the horse and his rider he has thrown into the sea. King David invites us to sing of the Lord, our Good Shepherd who feeds, guides, and saves us. Isaiah sings of the Suffering Servant, the Prince of Peace, and the Shoot of Jesse’s tree. Mary sings the Magnificat for her baby boy who is Emmanuel, the Word made flesh. The angelic choir and Palm Sunday crowds join heaven and earth in singing: Glory to God in the highest. Hosanna. Blessed is he who comes in the name of the Lord. Whether you’re reading the Old or New Testament, whether you’re at home or here in the Lord’s house, wherever God gathers his people, you’ll hear singing. This holy season of Advent is no different. Like Israel, David, and the prophets, our choirs, concerts, and midweek services resound with songs God’s promises fulfilled in Jesus’ birth. In Advent, we join the saints in heaven, Mary, and all the angel hosts in singing Glory to God in the highest, Hosanna to the King of David born in the City of David, for you. And so this Advent, Martin Luther will be our choir director as we sing and reflect on his famous Christmas hymn: From Heaven Above to Earth I Come. This Christmas hymn, like all good hymns, points us to Christ who was born for us, crucified for us, risen for us, and who will come again for us. In a brilliant stroke of storytelling, Luther begins to tell us the Christmas story from the angel’s declaration of Good News to the shepherds and to you. The angels in Luke’s Christmas story mirror the prophet Micah in pointing us to Christ. Like a good choir: the angel’s song, Micah’s prophecy of Bethlehem, Luther’s hymn, points us to Christ. In singing this hymn, we’re called away from ourselves, away from following the beat of our sinful, selfish, flesh, and directed to join the song of Good News of great joy this Advent season. And where does the angel, Micah, and Luther point us? Not to our feelings, not inside of us, and not to our heart (which Scripture says is wicked beyond measure), but outside of us to Christ who is born for us as one of us. We’re called to look - not up to heaven where we might expect to call upon God’s great glory, might, and power - but rather to look down. In Bethlehem, who is the littlest among the clans of Judah, and yet from whom comes forth the ruler of Israel whose throne becomes a manger; the Ancient of days who is born of a woman in the fullness of time. For you. Martin Luther once commented that if we want to find God, we need look only to the manger and the cross. For there in the manger and on the cross, we see God and his love revealed to us and for us, as he becomes one of us; he is weak and helpless, yet a mighty Savior from sin and death; he is true God and yet true man; he is an infant lowly yet the Holy One of Israel, the Word made flesh for us. We don’t often put a cross in our nativity sets, but maybe we should. That is, after all, why Jesus is born – to die for you. 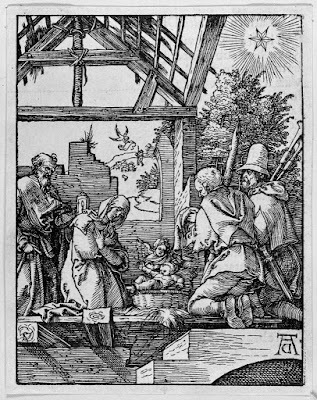 The artist, Albrecht Durer illustrated Christ’s birth (our bulletin cover) with this in mind. Jesus is front and center, surrounded by Mary and Joseph, and the shepherds. But at the top left corner of the picture is the cross. 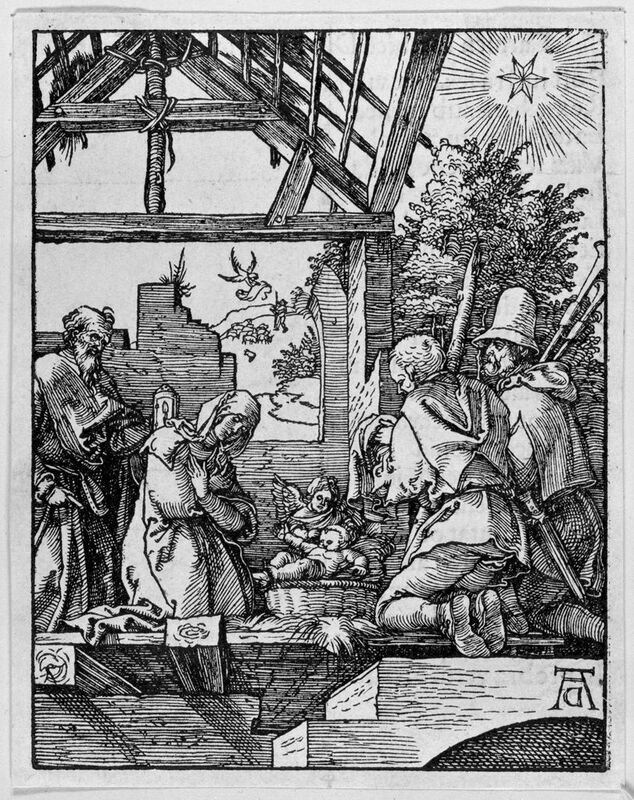 Like Luther, the angels, and the prophet Micah, Durer reminds us that the greatest gifts at Christmas are not under the tree, but the One upon the tree for you. This gift, Luther reminds us, comes to us wrapped in our humanity. Jesus is bone of our bone and flesh of our flesh. As we confess in the Athanasian Creed, Jesus is perfect God and perfect man; one…not by the conversion of the divinity into flesh, but by the assumption of the humanity into God. Or we could say it this way: Christ’s incarnation is one small step for God, one giant leap for mankind. The angel’s words tell us and the shepherds where to find God’s gift born to save us. By whom the heav’ns and earth were made." Jesus bears our humanity to save us. The Son of God became man so in him we might be called sons of God. Jesus is wrapped in swaddling clothes at his birth just as he is wrapped in burial clothes at his death…all for you. This is why we sing, today, tomorrow, and for all eternity. Sermon for Thanksgiving: "Contentment in Christ Crucified"
At first it sounds like Paul is joining the chorus of clichés we say to comfort ourselves or others in times of need. No doubt you’re heard it or said it before: “Don’t worry; be happy!”; “Que Sera Sera”; “Hakuna Matata”. To be sure, comparing Paul’s words, which are the Lord’s words, to coffee cup platitudes is like comparing your grandma’s homemade cranberry sauce to that imposturous red gelatinous substance in a can. And honestly, if we’re looking to Bobby McPherrin, Doris Day, or Timon and Pumba for comfort, we’re going to end up about as happy as a turkey on Thanksgiving. We can certainly understand how Paul would say this in good times. It would have been easy to rejoice when he was baptized, and his eyesight restored; or after he made it safely through the shipwreck on Malta; or when Christians in Philippi provided for his needs in the work of spreading the Gospel. But Paul didn’t sit down to write his letter to the Philippians after a good meal and a glass of wine, resting in his easy chair, with chestnuts roasting on an open fire. No, Paul was most likely in Roman captivity, imprisoned for preaching the Gospel. Before being locked in chains to sit in a cold, cramped, dark, damp jail cell, he would’ve been stripped, beaten, and humiliated. And yet, surrounded by the stench of blood, sewage, and death, Paul writes. Paul's not upset, he seeks no revenge, he doesn’t even complain. He rejoices. I have learned in whatever situation I am to be content. I know how to be brought low, and I know how to abound. In any and every circumstance, I have learned the secret of facing plenty and hunger, abundance and need. After the persecution, mockery, and suffering Paul endured, how can he say that? We wonder the same thing as we read this section. How can we say that? Teach us your secret of contentment, Paul. After all, it’s easy for us to rejoice and be content when we’re enjoying a Thanksgiving dinner-coma with family and friends; when our loved ones are healthy and well-provided; and when we can gather together in the Lord’s house to receive his bountiful goodness at his banqueting table in peace and quietness. But we know that life, especially around the holidays, isn’t always a picture fit for a Hallmark card or a scene from a Lifetime movie. It’s far more difficult to rejoice when there’s one more empty chair at the dinner table than there was last year; or when we and our loved ones battle cancer, disease, and despair; or when we look at the world around us and see see suffering, sorrow, and sin running rampant. There’s no platitude or cliché in the world that will give us any lasting contentment, comfort, and consolation. So, what do we do? Being the sons of Adam and daughters of that we are, we all too often take matters into our own hands. We look for contentment within, our desires of the flesh, our selfish wants, our self-serving thoughts, words, and deeds. This is what Martin Luther called navel-gazing; sin has starved us of true contentment and joy, and yet in our sin we are so warped and twisted that we only look to ourselves for contentment and joy. Like the children of Israel in the wilderness (in our OT reading), we promise to be faithful children of God and then by the next chapter (or in our case the next moment, thought, and breath), we’re busy building our own little golden calves. Paul’s words are so tough to hear because when he says, Rejoice in the Lord always, we’re reminded that we don’t always rejoice in the Lord, but rather in ourselves. Where, then, is contentment and joy to be found? Not within us, Paul says; but rather, outside of us. Rejoice in the Lord, he says. Humanly speaking, Paul appeared to have had every reason to boast in himself: If anyone else thinks he has reason for confidence in the flesh, I have more; circumcised on the 8th day, of the people of Israel, of the tribe of Benjamin, a Hebrew of Hebrews, as to the Law, a Pharisee; as to zeal, a persecutor of the church, as to righteousness under the law, blameless. And yet, Paul’s confidence, contentment, and joy were not in his flesh, but in Jesus who took on our human flesh to save us. Same is true for you. For us and for Paul, our contentment and joy are in Christ. In the Lord, he says. The Lord is near, he promises. The God of peace will be with you. Paul points us to Jesus crucified and risen for you and boldly proclaims: there is your confidence, your comfort, your consolation, and your contentment; there is your peace that surpasses all understanding; there is your true joy. Paul was no Pollyanna. He knew that further suffering, and eventually death, awaited him at the hands of the Romans. But more importantly, he also knew that none of that could rob him of Christ, that no one and nothing can remove him from Christ’s hands. Same is true for you. You belong to Jesus as surely as Paul did, by grace, through faith, in Christ crucified. That’s how Paul could declare, against the devil, the world, and his sinful flesh, that I have learned in whatever situation I am to be content…I can do all things through him who strengthens me. True contentment is given to you in Christ who though he was rich, yet for our sakes became poor, so that you, by his poverty might be made rich. True peace is given to you in the fullness of time, when God sent forth his Son, born of a woman, burn under the Law, to redeem you who were under the Law, so that we might receive adoption as sons. True joy is given to you in Jesus, who for the joy set before him, endured the cross and scorned its shame to bear our guilt, shame, and sin. Paul is content in all circumstances because his contentment isn’t grounded in his circumstances, but in Christ crucified. And so is yours. God gives you his everlasting contentment, peace, and joy in Christ Crucified. This Thanksgiving, you may feel like Paul did, alone and in a dark prison, tempted by despair. And yet, contentment is yours in Christ. Paul shouts into our darkness: The God of peace will be with you. The Lord is near. You are baptized; you are God’s beloved child; you are marked by the cross; you have his promised Holy Spirit, comforter. This Thanksgiving, you may feel weak, tired, and worn out from living in this weary world of sin, suffering, and death. Paul cries out: Christ crucified is your strength! And he strengthens you with a promise that rests – not on our feelings of joy or contentment, but upon his shoulders on the cross for you, his word of pardon, healing, and forgiveness. This Thanksgiving, your savings account, table, or chairs may be lacking. And yet again, Paul declares: God will supply every need of yours according to his riches in glory in Christ Jesus. Today Jesus spreads his banqueting table of forgiveness, life, and salvation is spread before you today. Today, the Lord is near to you in his body and blood for you, bringing you eternal contentment into our discontented lives. Today, Thanksgiving Day, and every day, your contentment in Christ Crucified. And the peace of God, which surpasses all human understanding, will guard your hearts and your minds in Christ Jesus. Sermon for All Saints' Day: "Church Family Reunion"
Who are these clothed in white robes, and from where have they come? John’s vision in Revelation reminds me of our own Schuldheisz family reunion every summer on the Oregon Coast. Who are all these Schuldheisz’s and from where have they come? At least in our family, reunions are a great time to catch up after months or years apart, eat way too much food, relive old memories and make new ones, and simply spend time together. It’s a little glimpse of the joyful reunion we wait for and long for in the resurrection on the Last Day. And that’s a good way to think about All Saints’ Day. Today we remember, and give thanks to God for those who have departed in the faith and now rest from their labors. 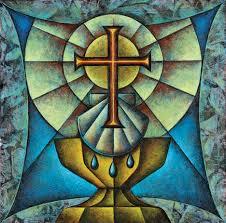 We remember, and give thanks to God for adopting us as his children in Holy Baptism. We remember, and give thanks to God, whether we’re here on earth, or asleep in Jesus that he calls us all his saints, his holy ones. Behold what manner of love the Father has given unto us, that we should be called children of God. And that is what you are. Hearing that, it sounds like All Saints’ Day is a great, big family reunion. Here God gathers his saints in heaven and earth for a feast, not around a buffet table, but at the Lord’s Table; we sing, not silly campfire songs like “The Old Family Toothbrush”, but the all saints’ family chorus: “Salvation belongs to our God who sits on the throne and to the Lamb!”; and we’re clothed – not in matching neon T-shirts – but in glorious robes made white in the blood of the Lamb. And no family gathering would be complete without a group photo to remember the present, a little reminiscing with aunts and uncles around the photo album to remember the past, and conversation that quickly turns to wondering about the future. The family reunion around the throne of the Lamb in Revelation 7 is no different. In John’s vision we see two family photos: one of the past and present, and one of the future. The past and present photograph shows the church militant, the church on earth marked by tribulation, trial, and suffering. John’s vision reveals that those who belong to God, from the Old Testament down through the New are sealed, chosen, marked as his own. Covered by Jesus’ promise just as you are in Baptism. God’s promise to Abraham, Isaac, and Jacob has been fulfilled. No one is left out of the church family photo-op. Yes, the saints of old faced countless trials, brutal persecution, and gruesome martyrdom…they lived as we do, under the cross. But together with the faithful departed, we are not alone in bearing the cross. For our Lord, the Lamb on the throne, bore the cross first, for us all. In this world we will have trouble, but fear not, Jesus says, for I have overcome the world. In this world we will suffer, but fear not, Jesus has suffered for you on the cross and suffers with you still. In this world we will have tribulation, but fear not; Jesus has borne all our tribulation, disease, and death in the great tribulation of Good Friday. Sin and suffering, persecution or pain, death or the devil – they have nothing on you because you belong to Jesus. You are his baptized ones, his holy ones, his saints. Behold what manner of love the Father has given unto us, that we should be called children of God. And that is what you are. Suffering and tribulation, disaster and distress may come. But none of that can take away Christ’s promise from you, nor take you away from Christ the crucified and risen one. You are not abandoned. You have hope. A future. And that’s what the second family photo in John’s vision of Revelation 7 reveals. 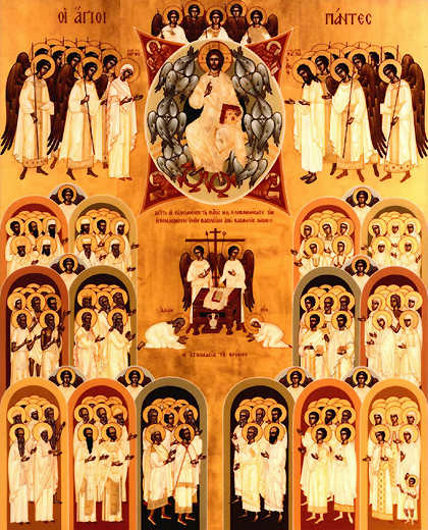 John shows us the great family reunion of the church triumphant, the saints surrounding the Lamb on the throne. Though this life is marked by suffering, we are also marked by the one who suffered all things for us. So, John’s vision reveals that we are also marked by Christ, adorned in white robes, made white in the blood of the Lamb. And once again we’re not alone. The Lamb is at the center, surrounded by the once suffering, now joyful saints before his throne, some of them we know by name and remember today: Chuck, Sandy, and David; and yet a great multitude that no one could number. “These are the ones who come out of the great tribulation, and washed their robes and made them white in the blood of the Lamb. So much is summed up in that little word, tribulation. These are the ones coming out of the ICU, hospice, and the nursing home. These are the ones coming out of a lifelong battle with cancer, mental illness, or any other number of diseases. These are the ones coming out of ugly divorces, broken families, and abuse. These are the ones coming out of still births, miscarriages, and childless homes. These are the ones coming out of church massacres, school shootings, and terrorist attacks. These are the ones coming out of suffering, persecution, and beheading all because they bear the name of Jesus. These are the ones coming out of earthquake, war, famine, and bloodshed. These are the ones, who, like you, are clothed in Jesus’ death and resurrection. 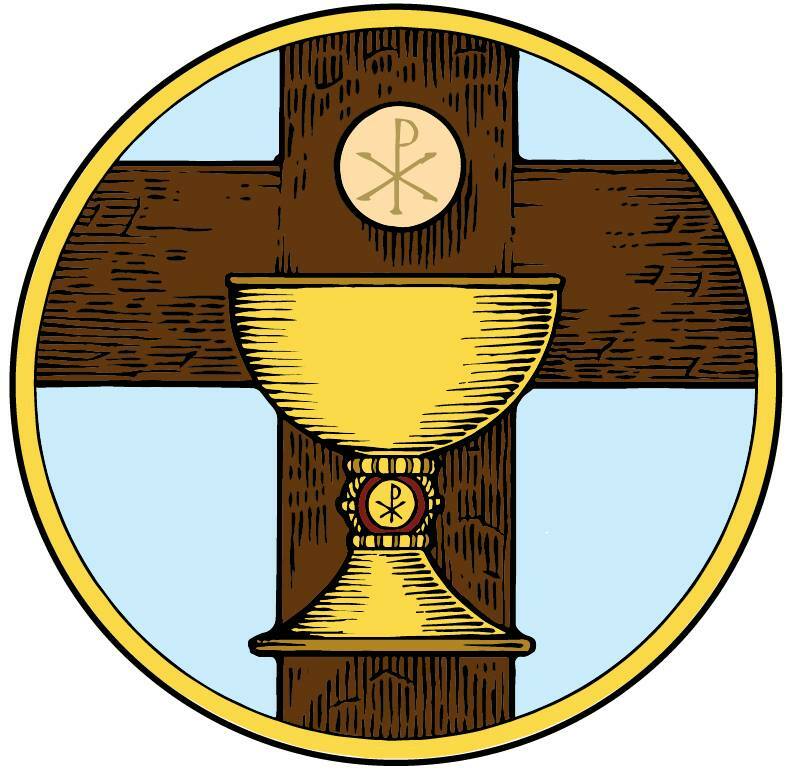 You see, this is what makes you a saint: not what you think or feel or because you deserve or earned it, but simply by the blood of Jesus shed for you. We’re adopted into God’s family by simple water and word. 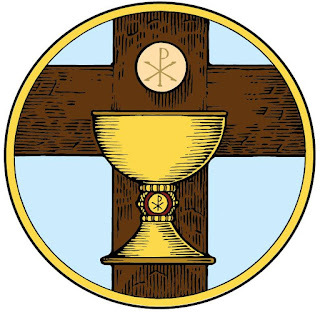 Jesus feeds and nourishes us, his children, with simple bread and wine that delivers us forgiveness in his body and blood given and shed for you. That same body and blood that was given for us on the cross, the greatest tribulation of all. God the Father gave us his only begotten Son so that in Jesus we might be called children of God. And that is who you are. Jesus declares you to be his saint, his holy one – and not only on All Saints’ Day…but every day. Even on days of suffering, tragedy, and tribulation. Someday, you too, will come out of this great tribulation. For the Lamb who sits on the throne dwells among you. You shall neither hunger anymore nor thirst anymore; the sun shall not strike you, nor any heat; for the Lamb in the midst of the throne will shepherd you and lead you to living fountains of water. And God will wipe away every tear from your eyes.